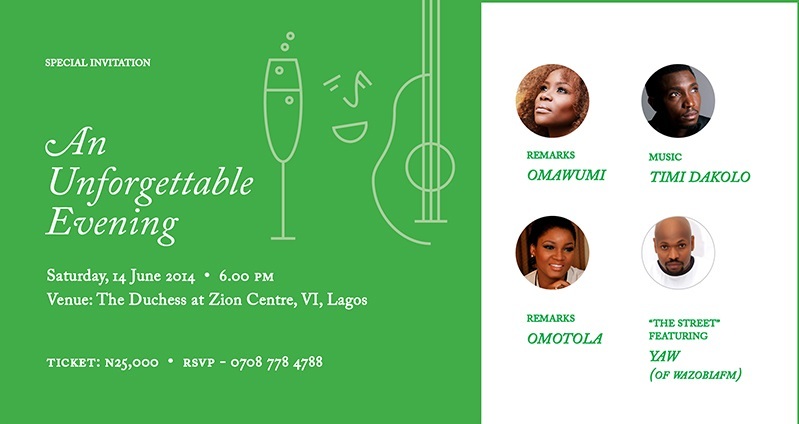 It promises to be an unforgettable evening of good music, laughter, networking and auction on Saturday 14th June 2014 when Enough is Enough Nigeria(EiE) holds its first fundraising dinner at The Duchess @ Zion Centre, Victoria, Lagos. Enough is Enough Nigeria (EiE) – a coalition of individuals and youth-led organizations committed to a culture of good governance and public accountability will hold its first fundraising dinner in Lagos. The objective of the dinner is to raise funds to support programs and initiatives that build on EiE’s strong record of promoting good governance through its core campaign – RSVP: Register| Select| Vote| Protect ahead of the 2015 elections. The fundraising dinner will also provide an opportunity for the organization’s supporters, volunteers and staff to mingle, have fun and renew their commitment to the non-partisan group’s mission. The event promises to be a memorable evening with Kate Henshaw, one of Nollywood’s leading ladies & social crusader and Kola Oyeneyin, entrepreneur and youth advocate will co-host the evening’s proceedings. Also expected is an impressive line-up of past & present supporters from the corporate, media & entertainment industries. Breathtaking performances are expected from soulful crooner, Timi Dakolo. Wazobia’s FM’s Yaw will present an excerpt from his political satire “The Street”. The evening will showcase EiE’s work over the last 4 years and its planned activities over the next 4 years. Banky W, Lanre Shashore, Odun Longe are expected to give testimonials. Omotola Jolade-Ekehinde, a Nollywood icon, will share her thoughts on citizen participation to close the evening. An auction will be one of the highlights of the evening as items like 2 tickets to the Abu Dhabi Grand Prix, Kelechi Amadi Obi’s photography services and 1 hour time slots with Wole Soyinka, Mo Abudu, Leke Alder, Fola Adeola and Keem Belo-Osagie! Tickets are N25,000 per person or N250,000 per table. There will also be a raffle and prizes include a 6-course dinner, spa packages, discounts on clothing, a dress from Tae and many more! Organizations and individuals have the opportunity to support the fundraising activities through the purchase of table packages or individual tickets. By hosting a table at the dinner, guests will be supporting the many projects that EiE undertakes. For tickets, booking & other enquiries, please call 0708 788 4788.